This website is about Knoppix, a Free and Open Source Live Linux CD. Knoppix is a GNU/Linux distribution that boots and runs completely from CD or DVD and can be used to read and write Windows and other partitions (among other clever tricks). The Knoppix CD and DVD include recent Linux software and desktop environments. The DVD includes programs such as OpenOffice.org, Abiword, The Gimp, Konqueror, Mozilla, Apache, PHP, MySQL and hundreds of other quality open source programs. Knoppix is suitable even for Linux beginners and we encourage you to try it and use the extensive help on our site if you need it. If you would like to learn more about Knoppix, you could look at the FAQs and Documentation, discuss it in the Forum, or just try it out! You can download for free the latest version of the CD (700 MB) or DVD (4.14 GB). You can also save yourself the trouble of downloading this large file and it burning to disk by buying it for as little as $1.95 (worldwide shipping). Simply follow this link: download / buy page. When you buy a disk we get a small commission that goes towards paying for and running this Knoppix.net site. 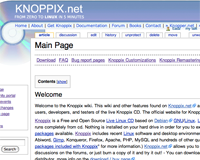 Knoppix.net is a resource for users, developers, and testers of Knoppix. 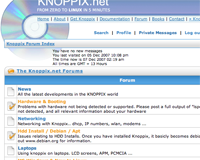 The official website for Knoppix is on Klaus Knopper's website at knopper.net.